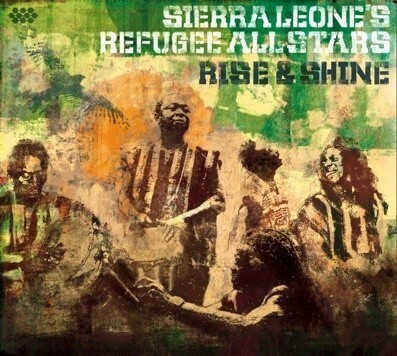 Sierra Leone's Refugee All Stars are reaching the end of the European leg of their tour and will be performing in the UK at the Womad Festival at Charlton Park, Wilts this weekend (22-25 July). Catch them at the Open Air Stage there at 1pm on Sun 25th and later doing a workshop at the Real Ale Bar at 5pm on the same day. After Womad the Refugee All Stars got to Trondheim in Norway on the 30th July before starting their American leg in August and September (for full details see their website below or that of their label Cumbancha). 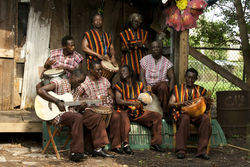 With their latest album, "Rise and Shine", the All Stars are riding high after being No 1 on the airwaves in June by topping the prestigious World Music Charts Europe. In North America, SLRAS was riding in the top 10 of CMJ's New World chart for 11 weeks in a row. "Rise & Shine" entered the CMJ chart at #7 and quickly shot to #1 where it remained for two weeks.